CRICKET WORLD CUP – Place your bets gentlemen! LAHORE – Gamblers and bookmakers come to business as Cricket World Cup 2011 begins today in Dhaka, with an opening match between Bangladesh and India. STAKES: Underground bookmakers or bookies have already put bets worth billions on the world cup winner. According to one estimate, nearly Rs 40,000 crore could exchange hands through illegal betting in this world cup. 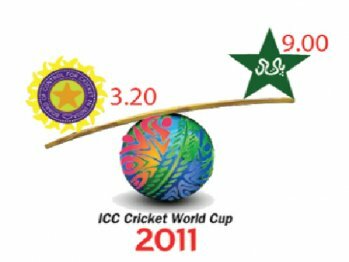 According to a bookmaker’s rates, India’s rate is set at Rs 3.20 (if one bets Rs 1000 on India and it wins, the return would be Rs 3200), Sri Lanka is set at Rs 5, Australia is set at Rs 5.20, South Africa is set at Rs 5.8, Pakistan is set at Rs 9, England is set at Rs 8, New Zealand and West Indies are both set at Rs 23. TEAM RANKINGS: Though cricket pundits neutrally rate all teams in this world cup, yet the gambling world has ranked India, Australia and Sri Lanka as most likely to be the winners. A bookmaker, on anonymity, told Pakistan Today that India was ranked at the top, Sri Lanka at number two, South Africa at three and Australia at four. Then comes England, Pakistan, New Zealand, West Indies and Bangladesh followed by Zimbabwe, while Ireland’s chances were remote, he said. MEASURING CHANCES: A bookmaker said citizens had already placed much of their bets worth billions by Friday. He said bookmakers received most of the bets on Australia, Pakistan and England. He said people were placing money on Australia because of its reliability and its record in last two world cups. He added that according to the betting pundits, at least two Asian teams out of Sri Lanka, India and Pakistan will qualify for the semifinals at least. He said chances were that India and Pakistan would qualify for semifinals at least, while one of the two could also qualify for the final. He said very few had placed bets on South Africa, a team which African gamblers are considering to be the world cup winner. TYCOONS EXPOSED: A bookmaker, while exposing the bookmaking net, revealed that four to five parties were the top bookmakers of Lahore including Haji Naeem group, Mian Ijaz and Rana Shamshad. He said basically the betting starts from Dubai, Mumbai and South Africa. He said the aforementioned gamblers had direct links with the gamblers in India, Dubai and South Africa. He said these bookmakers distributed lines for bookmaking further in their sub agents. He said that Lahore had become a hub of bookies in recent few years and betting on cricket matches had topped the underworld. He said 3 to 4 bookmakers on average were running gambling books in one street of any area. “One could not believe on the number of bookmakers functioning in the city as a minimum of 50,000 bookmakers function in the city”, he said. A bookie told Pakistan Today that the gambling business was on the rise in the city because the ‘system of book’ could be installed any where with two phone lines. He said most of the business had shifted on mobile while the secrecy had also doubled its charm. He said that police have never managed to arrest the main gamblers owing to their ‘strong connections’. CAMOUFLAGED: Sources from the gambling world said that with the arrival of cricket world cup bookmakers had changed their locations and had gone ‘underground’ to save themselves from police raids. They said a few renowned gamblers had also installed security cameras at their places to check police movement. POLICE IN ACTION? : According to Model Town Police Station SP, top cops of Lahore Police have directed all divisional SPs to take gamblers to task in their respective divisions. He said Model Town police was determined to catch such gamblers and had launched a drive, during which a renowned bookmaker Shahid was arrested two days ago, while they had also recovered gambling money worth millions, laptops, desktop computers, mobile phones and gambling books.